Dio has a home! 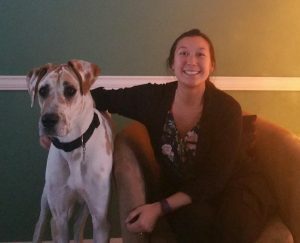 - Rocky Mountain Great Dane Rescue, Inc.
Dio has a home with his foster family in Aurora, CO. Ria & Craig have been waiting for the right time to fill the hole in their home and hearts after loosing their last Dane a year ago. When Dio was placed in their home as a foster…..that shy, scared, apprehensive boy warmed up quicker than anyone imagined. Dio knew he found his spot and wasn’t going anywhere else. He’s come out of his timid shell and is loving the undivided attention in the home. We are so happy for Ria & Craig. They have affectionately renamed him “Ludo”. Way to go sweet boy!